PokéSunday | America loves Sporks! Each blue dot is a pokéstop where you pick up supplies, each red dot is a Pokégym where the three factions battle for “control” of the gym for somewhat dubious benefits. It helps to know that downtown was built aligned to the Southern RR that runs from Atlanta to Richmond, which is why “up”town is not a grid that aligns north and south. It also predates the USGS surveys done in the 1890s that split the country into one mile squares called sections. The problem is you can’t play Pokémon and drive. Finding on street parking during the week is a little hard. It’s too warm in the afternoons for an old guy with a cane to walk around. So on Sunday morning, few people will be in uptown, unless the transgender teacher union is having a convention. So it should be easier to pull into parking spots – no need to feed parking meters on weekends. Even during the week, they are $1 an hour, reasonable by Chicago standards. So that was basically the case – more traffic than I expected, but a lot less than weekdays. 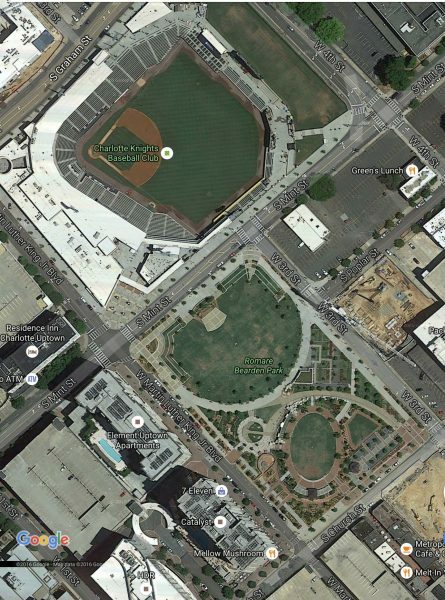 But there was one little piece of uptown where parking spaces were in high demand – Romare Bearden Park, across the street from the baseball stadium, and surrounded by new high rise buildings under construction. It didn’t take long to figure out this park is the epicenter of pokésociety. It turns out there have been gatherings here of 1,000 people playing Pokémon. 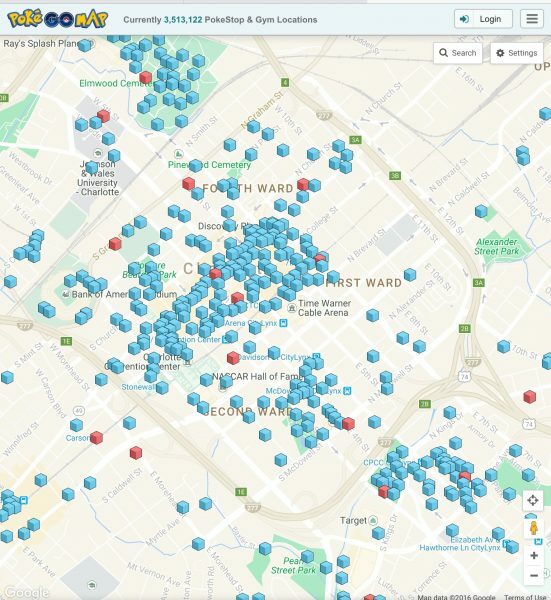 There are 7 pokéstops inside the park and several dozen within a couple blocks. You might be wondering who Romare Bearden is/was. He was a native of Charlotte who went on to fame in New York City creating works of art picturing black life in America. Many uptown residents want to believe they are living on the Upper West Side of Manhattan, but at cut rate prices. This park is Harlem. Bearden was born in Charlotte,,but had no real roots here. The park exists to reassure Northern liberals that they are not part of the South, but rather embrace the enlightened diverse New South – as long as the black people don’t move into their building.